NORTH MERRICK, Long Island (WABC) -- The knife-wielding serial robber who's been behind over 10 robberies on Long Island over the last two months has allegedly struck again. Police believe that the man was behind two more incidents in Nassau County on April 15th. 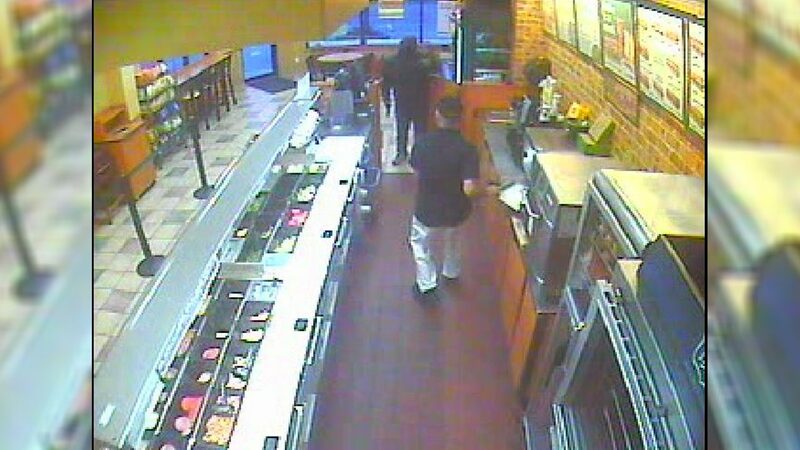 Investigators say the man began his Saturday night by walking into a Subway franchise in North Merrick just after 7 p.m.
That's when he pulled out a large kitchen knife and demanded money from the worker at the register. The victim managed to press the panic alarm, after which the suspect got away without any money. Approximately two hours later, the suspect allegedly targeted a TCBY yogurt shop in Lynbrook. Police say the man was most recently behind the robberies of a convenience store and a Gamestop last week. The suspect is described as 5'8" tall, average build, and was seen wearing a dark hat, dark jacket, blue jeans, white sneakers, a gray scarf that covered his face, and gray gloves. Anyone with information on either of this weekend's incidents or any of the robberies over the last two months can call Crime Stoppers anonymously at 1-800-244-8477.